So remember last summer, when I was in NYC, and I posted on a regular basis and my life was way more fascinating? Well, that all sort of stopped so, sorry about that. But I guess life should be fascinating all the time, not just when you are living in New York City and interning at the Whitney Museum of American Art. So I am going to attempt to find the interesting in the everyday. Please forgive the cheesy Hallmark Card sentiment. Okay, so, what have I been doing? Well, I still work here, but I’m also working on changing that. That’s Deep Space 9, just in case you are wondering. 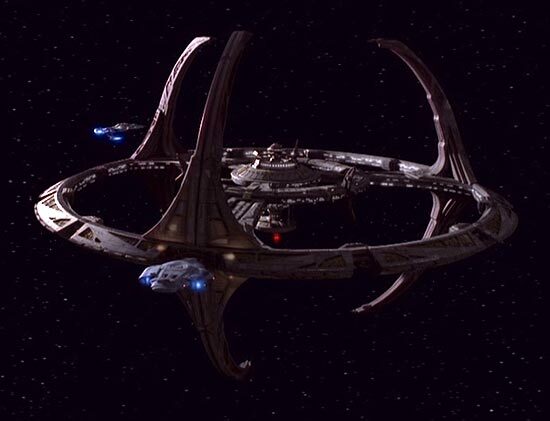 The station, built by Cardassians and formerly called Terak Nor, hangs out in space near the planet of Bajor, in a guardsman position to the Wormhole to the Gamma Quadrant. 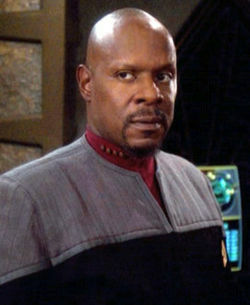 That’s Benjamin Sisko, played by Avery Brooks. He’s the commanding officer type on the series. He’s also the Emissary to the Prophets. If you want to know what that means, you should watch the show. I’m eating some too. I’m making a lot of this chopped caprese salad from Smitten Kitchen, because it is fresh and easy. Tonight some chicken meatballs might happen. Lately there have been a lot of salads, also. I’ll post as things become exciting. Oh, also, I went to Mama Dip’s on Saturday night, but since it was a last-minute trip I had no camera. I got fried green tomatoes, which were excellent and had a corn mealy crust. I had fried chicken, also reliably good, some better-than-average macaroni and cheese and some decent cole slaw. I’m sure that at one point this restaurant was awesome and soul foody, but I guess it has gone downhill since Rachel Ray or whomever discovered it. Also, I rarely eat fried food, so it always leaves me feeling heavy and gross. Probably won’t go again, but I can finally say that I went, and it was fun to break cornbread with friends who I hadn’t seen in awhile. I have done some other things as well, such as visit New York City and check out the new North Carolina Museum of Art. I’ll post on those later, just to keep y’all reading. Okay, this is my endeavor to get back to it. Let us hope it keeps working.